There were no signal failures in this express fit out for National Rail in the heart of Glasgow. Delivered in a tight programme of just eight weeks, we worked with Network Rail to deliver a new 17,000 sq ft office space that supported their organisational transformation to flexible working. The client wanted an office that embraced the heritage of Scotland and Network Rail's contribution to its history. We took this opportunity to feature local landmarks, such as the iconic Forth Bridge, in the glass transfers on the meeting room walls. These provide the meeting spaces with enhanced privacy, while also letting natural light flow across the floor and through the meeting rooms. To increase room utilisation, all bookable meeting rooms are fitted with smart booking systems that allow staff to instantly see if the space is unbooked, and how long for. Network Rail's designers and engineers needed a dedicated space to review detailed drawings. The best solution here was to provide them with a dedicated design hub; complete with LED backlit benches. These are the perfect place to review documents, while also serving as a collaboration point for other teams. 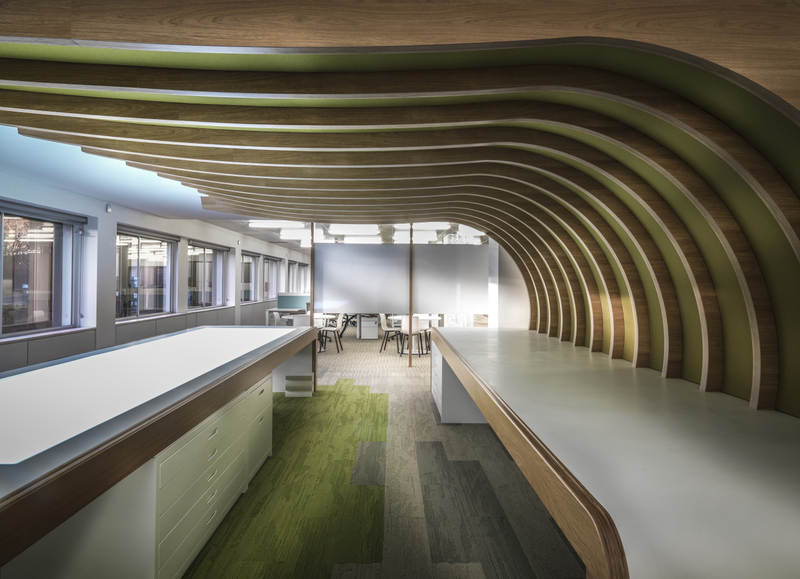 The wooden slats and sound-absorbing panelling to one side help absorb acoustics to prevent excess noise travelling across the open plan floor to other work areas. One of the goals of their new fit out was to introduce flexible working spaces, with plenty of areas for collaboration and breakout space. Open plan meeting spaces were essential in delivering this mandate, with a number of smaller open plan breakout spaces delivered to drive collaboration. These were fitted with acoustic-absorbing finishes to ensure that any noise didn't travel too far across the open plan floor. 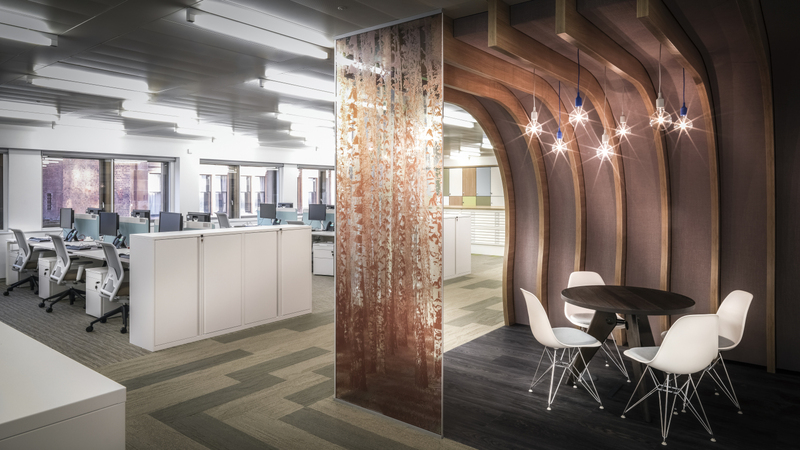 This particular breakout space provides a natural biophilic boost through it's use of wood; including the woodland scene glass transfer, chocolate brown wooden wall paneling and the dark timber table. To maintian a balance, the space is kept bright with designer light fittings. My experience of visitng the site was excellent - our building manager loved Overbury!